Mass start 45 and 60 minute score event. NB Start is not at the registration point - we will walk there. Bring a good torch and a pen. Quite a lot of unlit and muddy paths - studded shoes advisable. Tony strongly recommends that you wear/carry a cagoule. The weather forecast is showers, possibly snowy. Quite a lot of wind chill on the higher ground. Please carry a phone - my number is on the map. A few of the controls are on Ilkley Moor. Very easy by train. Wheatley Arms is 200m uphill (South) from the stating. By car, turn left, if coming from the east, into Wheatley Lane at the first traffic lights on entering Ilkley. Under the railway bridge then go straight on where the main road goes sharp right. Assembly is in the Wheatley Arms car park on Brighton Road, which is on the left hand side of Wheatley Lane. NB You can park in the Wheatley car park if you are staying for food/drink - otherwise in nearby streets please. Registration 6.30 - 6.55 at the Wheatley Arms LS29 8PP. 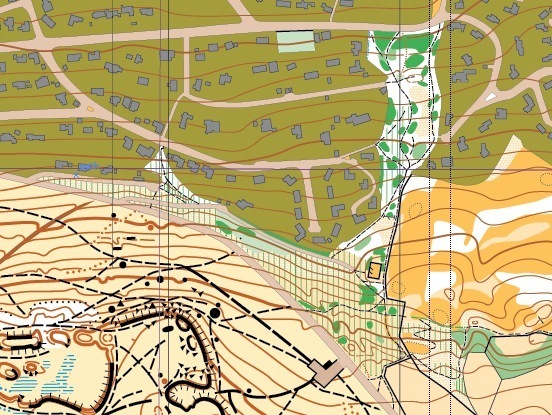 Mass start is a shortish walk away from the Wheatley - we will leave for the start at 7.00pm sharp. 45 minute and 60 minute courses. Control sites are street furniture where available (NB pole=telegraph pole, post=lamppost). Otherwise numbered/coloured tapes. CDs on front of map. The map is a new 1:5500, 5m contours, printed on pretex. Mostly ISSOM (urban O) but Ilkley Moor is enlarged ISOM (terrain O). Mostly urban but some muddy and vague unlit tracks and some steep moorland which can be avoided unless you want to get all the controls. Please take care crossing roads. And observe the out of bounds.